We’ve been working on storm damage repair projects in Alliston for many years now and guarantee we know exactly what it takes to restore your damaged roof. 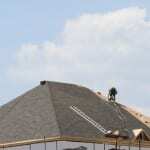 When your roof is damaged by a big storm, you might think that a few missing shingles or a minor leak is no big deal. Although you might be able to live in your home like normal after your roof is damaged by a storm, forgoing the storm damage repair process can be a big mistake. At Slippery Slope Roofing, we can’t stress enough how important it is to fix your roof as soon as possible after it’s damaged by a storm and want you to know we’re here to help you with every part of the process. We’ve been working on storm damage repair projects in Alliston, Ontario for many years now and guarantee we know exactly what it takes to restore your damaged roof. When you reach out to us for help, we’ll start things off by fully inspecting your roof to get a better feel for how bad the damage really is. Once we do this, we’ll put together a plan of action and get started as soon as we can on fixing your roof. Our team will work quickly, communicate with you throughout the entire repair process, and make sure you’re completely satisfied with the quality of our work. If you’re ready to work with a storm damage repair professional who has your best interests in mind, you can’t go wrong letting our team at Slippery Slope Roofing fix your roof. For more information or to receive a quote on repairing your roof, give us a call today.